At this year’s Comic Con in New York, toymaker Sphero has announced that it’s adding a brand new app-enabled droid to its Star Wars line which already includes R2-D2, BB-8 and BB-9E. Called R2-Q5, this droid is basically R2-D2 Imperial Edition, which first appeared in Episode IV: Return of the Jedi. To make absolutely clear that Q5 is a more angsty, bad boy R2-D2 it has a dramatic bronze and black color scheme, reminiscent of the espresso martinis we like to imagine Imperial soldiers enjoy after a long hard day of being evil. Despite differences in appearances and loyalties, Sphero’s R2-Q5 will work in the same way as its R2-D2 droid. This means you’ll be able to manually drive Q5 or leave it to patrol your home. If you can trust it not to hand your life story over to the Empire. As well as this, it will have an integrated speaker, working lights, augmented reality features from within the companion app and be able to take up both bipod and tripod stances. Thanks to a new update to the Sphero Edu app, all of Sphero’s Star Wars droids will also now have brand new custom animations and movie-accurate sounds, as well as the ability to interact with one another and react in different ways to different parts of the Star Wars films as you’re watching them. As if you needed another excuse to pull out the DVD collection before Episode 8. R2-Q5 will be available for pre-order from October 10 2017 and stock numbers are expected to be very limited. 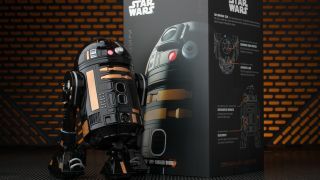 The droid will cost £199.99/$199.99 and will be exclusive to John Lewis in the UK and Best Buy in the US.